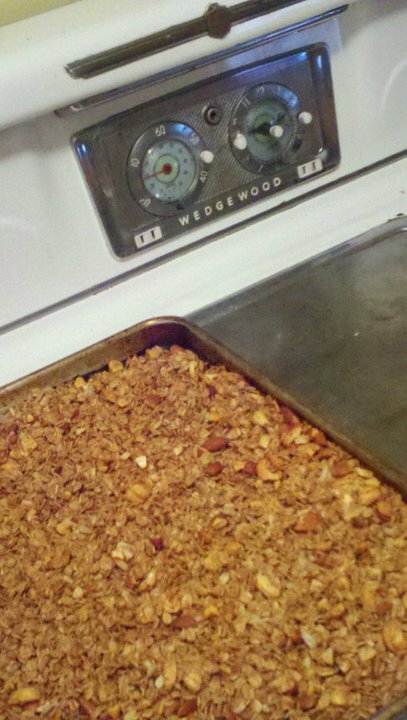 For years friends called me “granola girl” because I couldn’t stop making granola and sharing it. One friend liked it so much he started making it at his cafe, in place of a version he was buying, to put on top of yogurt and fresh fruit. I don’t make granola nearly as often as I used to, but something about the damp cold weather we’re having this week makes me long for my granola girl days. In fact, I’m thinking about putting some in the oven right now. Every so often someone asks me for the recipe so, I thought I’d share it here. Enjoy! Mix the dry ingredients together in a large bowl: 9 cups of rolled oats (not quick cooking), 2 tsp cinnamon, 1 tsp sea salt, 1 cup coarsely chopped raw almonds, 1 cup coarsely chopped raw cashews, and 1/2 cup raw sunflower seeds. In a small sauce pan on medium low heat combine 1/2 cup vegetable (canola) oil, 3/4 cup maple syrup, 3/4 cup honey and 2 Tbs vanilla until they blend together nicely (the honey melts into the syrup) and it just begins to smell. Add the wet ingredients to the dry ingredients and mix them together thoroughly. Spread the mixture evenly on two cookie sheets with edges (if the sheets don’t have edges the granola will slide off when you turn it and you must turn it). To begin, bake for about 10 minutes and then you turn the granola with a metal spatula (metal works best to get the good sticky sweet stuff up each time from the bottom of the cookie sheet). Then bake it for another 7 minutes and turn it again. Continue to bake it for 5 minutes and then turn it …bake it for 5 minutes and turn it. As the granola gets darker, start turning every 3 minutes as it will very quickly get too dark so you have to pay attention and take it out when it’s as brown as you like it. I sometimes switch the two sheets in the oven rack around 30 minutes in… depends on how evenly your oven cooks. Turning it regularly is the KEY to successful texture. It usually takes about an hour but sometimes it’s less. Even if it seems like it’s taking forever and not cooking, don’t stop watching it and turning it. After it cools add a handful of dried cranberries or raisins. If you don’t turn it often the texture will be inconsistent… ie. overdone and crispy on one side of the oat and damp on the other. If you use butter or olive oil instead of canola it won’t taste the same. In fact, don’t do it. Any nuts are good so you can pick and choose what you like. I just mentioned my favorites. Sometimes I don’t even add nuts which is fine too… just less yummy. If you use agave instead of maple syrup, that’s fine but it will taste different. Personally, I prefer Vermont maple syrup… the good stuff. Enjoy with milk, plain yogurt, ice cream or just by the handful.